Her support for the boycott, divest and sanctions movement to pressure Israel to improve treatment of Palestinians is making Jewish leaders nervous. In Saudi Arabia, a state-owned newspaper recently suggested she was part of an Islamist plot to control Congress. And at home in Minnesota, Ms. Omar has been dogged by claims that she briefly married her brother for immigration purposes — which she called “absurd and offensive” — and by charges filed by a conservative Republican colleague in the Minnesota Legislature that she violated campaign finance laws; a state campaign finance board found “probable cause” that she did and is investigating. “She’s the epitome of the so-called American dream, but for much of white Christian America, she’s an American nightmare,” said Larycia Hawkins, who teaches politics and religion at the University of Virginia, and lost her job at an evangelical college after wearing a hijab in solidarity with Muslim women. Ms. Omar, a slight 36-year-old with a soft voice and delicate features, envisions herself as a voice in Washington for the disenfranchised, for marginalized people and for immigrants like herself. She came up in politics as a community organizer, working on issues like hunger and inequities in the juvenile justice system. When she arrived in the capital for freshman orientation, she ran into Representative John Lewis, Democrat of Georgia and a civil-rights icon — and burst into tears. Ms. Omar’s life story is, in many respects, uniquely American, an immigrant who worked hard and made good. She also embodies the complicated crosscurrents around immigration, race and religion that dominate Mr. Trump’s Washington. When she was 8, Somalia erupted into civil war, and her extended family fled to a refugee camp in Kenya, where they spent four years before seeking asylum in the United States in 1995. They settled first in Arlington, Va., and later in Minneapolis, whose large Somali population Mr. Trump has called “a disaster” for Minnesota. Her father, a teacher in Somalia, picked up work driving taxis and later got a job at the post office; her mother died when Ms. Omar was 2. Her arrival in this country was the first time, Ms. Omar has said, that she had confronted “my otherness” as both a black person and a Muslim. She became a citizen in 2000, when she was 17. After the Sept. 11, 2001, attacks, she decided to wear the hijab, as an open declaration of her identity. But from “the first day we arrived in America,” she said, she concluded that it was not the golden land that she had heard about. As a candidate, rallying voters for a $15 minimum wage, more relaxed immigration policies, Medicare for all and other progressive agenda items, Ms. Omar proved herself sure-footed and tough, with a flair for inspirational rhetoric — traits that her predecessor, Representative Keith Ellison, Minnesota’s incoming attorney general, attributes to her early childhood in Somalia, as the daughter of a well-to-do family of educators. Running for office meant upending gender norms in the Somali community, where politics is typically the province of men. It also forced Ms. Omar to make public details about her complicated private life, which became fodder for conservative bloggers, who seized on her brief marriage to a British citizen. They have since divorced; earlier this year, she married her current husband, Ahmed Hirsi, the father of her three children. 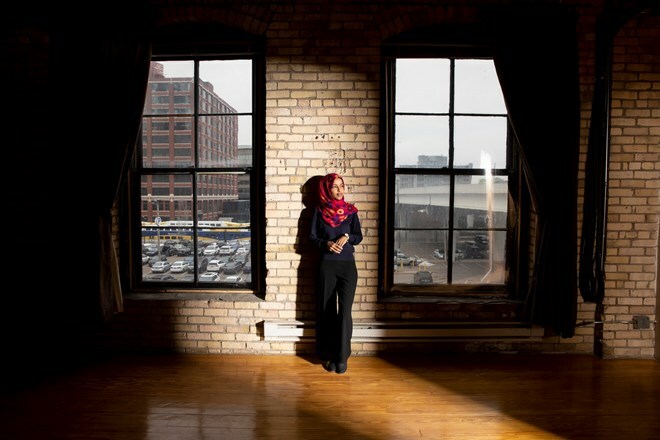 Her election that year made her the first Somali-American state legislator in the nation, but some conservative colleagues were put off by her frank talk about race, religion and discrimination. And Ms. Omar’s careful answer on the 2018 campaign trail to questions about Israel — and her postelection clarification that she does indeed back the boycott, divest and sanctions movement — has left some Jewish leaders feeling betrayed. Ms. Omar’s admirers see her as a powerful symbol, whose “mere presence will hopefully help to educate the American people about who Muslim women are,” said Farhana Khera, the executive director of Muslim Advocates, a civil-rights group. Already, she has worked with Representative Jim McGovern of Massachusetts, the incoming chairman of the Rules Committee, to carve out a religious exception to the no-hats rule. She gave a hint of her style in her sassy response to the pastor, Bishop E. W. Jackson, who complained that the House floor would look like an Islamic republic.